Mount virtually any Küryakyn Motorcycle Luggage, or similar luggage with D-rings on lower portion of bag, with this new Universal Bag Mounting Kit. If you want a small, nice looking bag that holds its shape and is great for the basics, this is the one. 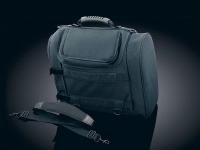 With a windowed top pocket, multiple storage organizers and expansion capabilities, this bag has it all. And to top it off, you can mount it about anywhere - luggage rack, backrest, or atop your gas tank! 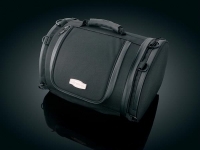 The Daily Tour Bag provides just enough room for items needed on a full day or overnight journey. 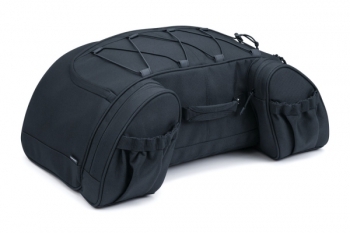 The semi-rigid bag holds it's shape empty or full & mounts about anywhere on the back of your bike. Here's a bag that does double duty. Designed from the start to serve as both a rigid frame backrest and a bag, the Tombstone Bag provides solid lumbar support and a handy place to store essentials. Zippered pockets, clips and pouches inside the bag keep everything organized and easy to find. 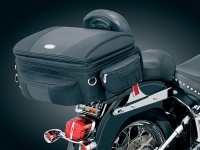 The Tombstone Bag is designed to fit on all motorcycles with a passenger backrest. A dual adjustable hook and loop strap system goes through and around the solid PVC frame to attach securely to the backrest. You need major storage? Here's the answer. With its large center compartment and 2 large end compartments per side, pack away! Still need more room? Expand each end compartment 2" for that extra room. With its semi-rigid construction this bag holds its shape no matter how much you pack. 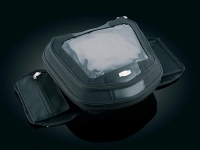 Perfectly sized, this bag provides back support for the rider when mounted on the passenger seat. Lean back and enjoy. Plenty of sturdy D-rings allow you to bungee additional items to the bag or lock the side pocket zippers if needed (small padlock not included). The weather is little threat with traditional Küryakyn weather resistant construction and self-sealing zippers. This bag provides ample protection for your items. Use the convenient shoulder strap for carrying the bag after a long day of riding. This versatile bag is the ultimate companion for weekend trips or short tours. 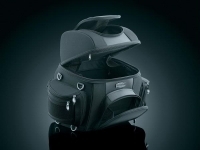 It helps the main compartment hold its shape - even when empty - and it provides adjustable lumbar support for the rider's back. Large zipper pulls are glove-friendly. Retractable locking device keeps bag right where you want it. Made of 1200 Denier and leather, the weather-resistant GranTour Bag comes with a rain cover for added protection. Mounts directly to your luggage rack or your passenger seat! Mount the GranTraveler as a tour trunk or on top of your tour trunk for extra storage room. The semi-rigid construction and adjustable universal straps add ease when securing this bag to your motorcycle either packed full or empty. Features an expandable top which gives you added flexibility to keep it small or enlarge it for extra room when needed. 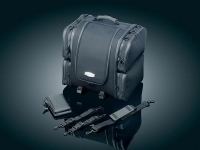 Additional internal and external compartments offer you multiple options for packing. The two end pouches quickly release and come with optional adjustable straps to carry over your shoulder, around your waist, or use the belt clips to conveniently take items with you. The pullout handle and wheels make dragging this bag to your motorcycle and in the airport a snap. In traditional Küryakyn design, this bag has weather-resistant construction of 1200 Denier material with leather accents for style. Full rain cover included for that severe inclement weather. For the serious motorcycle traveler it's hard to beat.